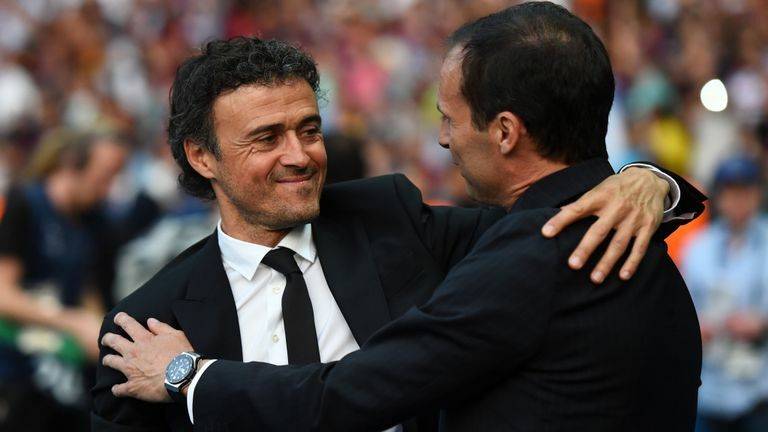 Arsenal want Massimiliano Allegri or Luis Enrique to be their next manager but both have concerns about taking the job because of the club’s management structure, according to Sky sources. Arsene Wenger bid an emotional farewell to the Emirates on Sunday ahead of his departure this summer and the search to find his replacement is well underway. Arsenal appointed a head of football relations (Raul Sanllehi) and a head of recruitment (Sven Mislintat) last year and the new manager would have to work closely with both. Allegri, who has two years left on his contract at Juventus, looks set to lead the club to a fourth successive Serie A title this season. The Italian is the favourite to succeed Wenger, while Carlo Ancelotti and Liverpool assistant coach Zeljko Buvac are also still among the frontrunners. Former Barcelona manager Enrique is ready to return to the game after taking a year off following his departure from the Nou Camp last summer. Mikel Arteta has also been linked to the job. The former Gunners midfielder is working as an assistant to Manchester City head coach Pep Guardiola.